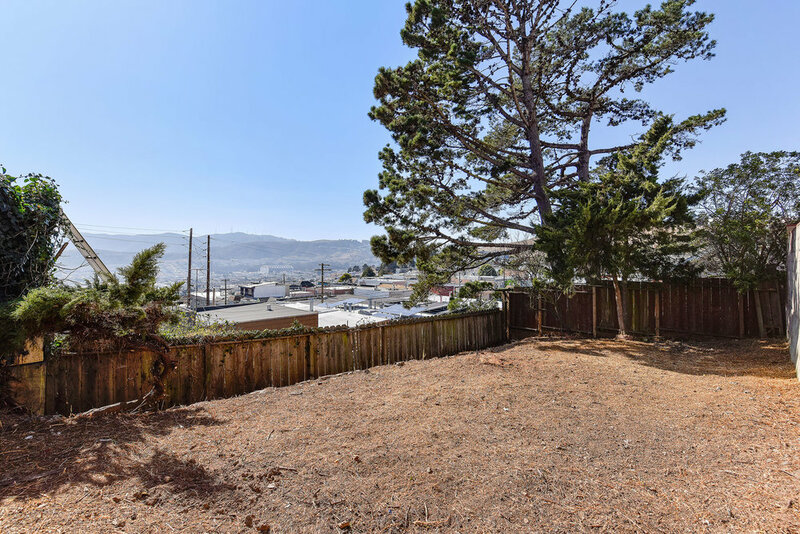 Come and build your dream home on this quiet, hilltop street in desirable and sunny Visitacion Valley. This 480 sq ft home sits on an expansive 2500 sq ft lot, presenting incredible opportunity for developers, contractors, or the handy owner. The opportunities and options are endless for this fixer: 1) Cosmetically remodel existing property 2) Easily expand to a 2 bedroom 2 bathroom with provided plans, or 3) Design and build your 3-story dream home. A home of up to 3,500 sq ft can be built. (Buyer to verify with City.) From the serene backyard, you can see incredible views of Portola and McLaren Park. Great opportunity for developers! Lots of land, tons of potential! Short walk to Bayshore train stop. Easy access to Caltrain, Muni T-Line, Hwy 101 and Hwy 280, and San Bruno Ave shopping and restaurants. Complete with 1-car attached garage. Seller has submitted plans to the City to remodel into a 913 sq ft, 2-story, 2 bedroom 2 bathroom house. Still awaiting approval, but buyer is welcome to use these plans. Property to be sold in AS-IS condition.